The US stock market shows price data all the way back to 1790. It can be fitted into long term cycles, which result into Elliott waves. The popular opinion is that we are approaching the top of a Grand Supercycle trend. It implies that a long and deep correction is ahead of us. Our conclusion is very different to that and we base it on Elliott’s rules and guidelines. Nobody reading this will witness the top of the Grand Supercycle during their investment career! The last fractal, Supercycle wave (V), is too short in terms of price and time to be near completion as we write this. It is just 9 years young versus its 72 year lasting Supercycle wave (I) sibling. Supercycle wave (I) started in 1857 and carried into the Great Depression. Supercycle wave (III) took 68 years as well. Hence, a 9 year swing does not fit into that picture. The S&P 500 has completed a (IV) wave of Supercycle degree at its March 2009 bottom from a long run Elliott wave analysis perspective. The long-term picture is analogous to the Dow Jones Industrial Average. Both indices show alternation between Supercycle wave (II) and (IV). Wave (II) was sharp, simple and retraced a great portion of wave (I) whereas wave (IV) finished as a complex and shallow irregular flat. 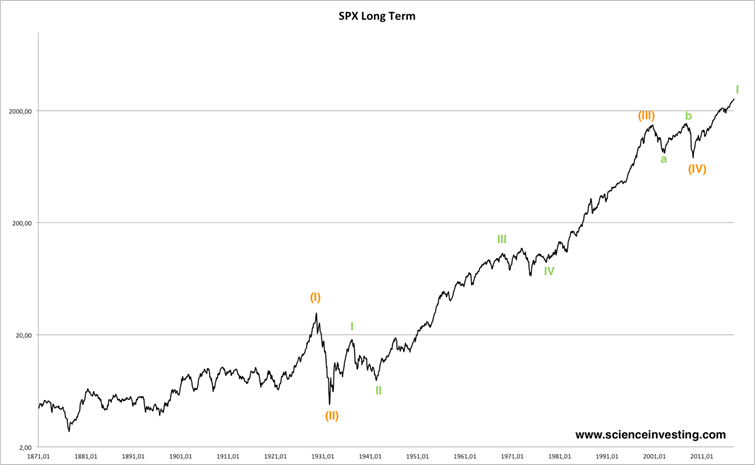 Despite being shallow, Supercycle wave (IV) retraced more than a 38.2% Fibonacci of Supercycle wave (III) on a log scale. Price action during Supercycle wave (III) shows extended behavior. All of this is a textbook fit of Elliott’s rules and guidelines. Price action confirms our thesis. Supercycle (I) recorded a twentyfold increase in stock prices. Supercycle wave (III) shows a two-hundred fold increase during its extended cycle. The odd one out is the current swing from the March 2009 bottom. It records a fourfold price increase. That stands out again and does not fit into the overall picture. It is way too short! We are currently most likely approaching the top of cycle wave I, which we expect to take place around 2021. Thereafter, wave action needs to develop cycle waves II-V until the Grand Supercycle completes in US equities. The German Dax index confirms the US equity picture. 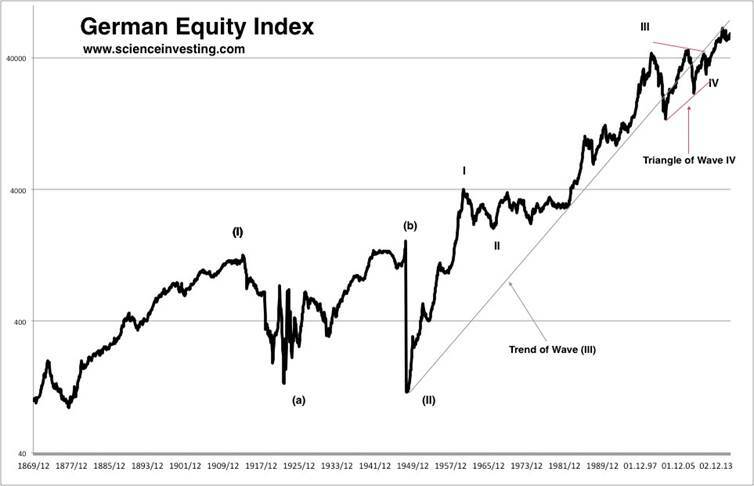 German stock are completing a fifth wave of cycle degree. We see there a post triangle resolution to the upside. The fifth wave of cycle degree started in 2011. It is too young as well to be complete. More important, we see a three wave swing to the upside since the triangle resolved to the upside. This hints to a 1-2-1-2-3 setup in German equities. That setup after a triangle resolution resolves into strong progress to the upside usually. Again, German equities are way too short in their fifth wave with respect to time and price action as we publish this. Cycle wave 5 will probably run into 2021-2023 before it is complete. After that, the Dax will correct in a fourth wave of Supercycle degree and rally over the next decades. This confirms the picture on the S&P 500. It would have been surprising to see a different conclusion on a western G-8 economy. The implication of an objective interpretation of the S&P 500 Grand Supercycle is a secular bull run into 2021. It will be corrected thereafter and progress further during the next decades. This translates into a bullish outlook from today’s point of view. How is this possible despite elevated equity valuations at the time we write this paper? Most likely due to nominal economic growth. Nominal growth is decomposed of factors such as inflation, population growth, technological growth, etc. These factors affect earnings. Especially our inflation forecast is likely to play a key role in this equation going forward. Stocks are a nominal assets and likely to increase during inflationary periods. The Grand Supercycle top has been called way too often during the past couple of decades. The same analysis will continue to make this call if they do not objectively analyze the long term cycle. They are currently off target by about six decades. An inflation driven bull run is more likely instead of witnessing the Grand Supercycle top in the next ten years.